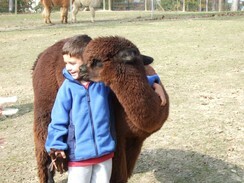 Wildwood Alpacas is an alpaca farm located in Woodford, Virginia owned by Judy Howe & Sue Hammer. Summertime is time for the new crias to soak up the sun, run around playing, building up those nice straight legs while their moms enjoy the green grass. Lots of sunbathing going on in all the pastures and sometimes cars driving by the farm stop to make sure the animals are still breathing! The fans are on and we hose everyone down a couple times a day, which they love. Please call 540 604-4914 if you'd like to visit. The boys check out a new female. 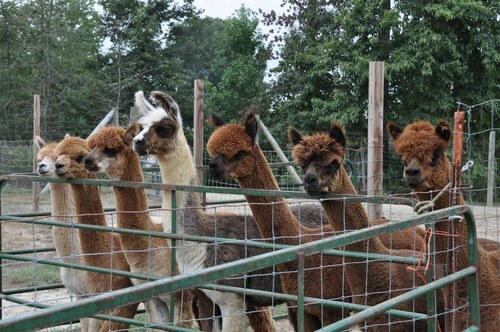 Wildwood Alpacas is a small, hands-on farm located in historic Virginia between Bowling Green and Fredericksburg. Our goal is to breed healthy, easily handled alpacas with the exquisite fleece we need to be competitive in the fiber industry. We are breeding to elite males with the goal of steadily improving fiber characterisitics of our dark animals. 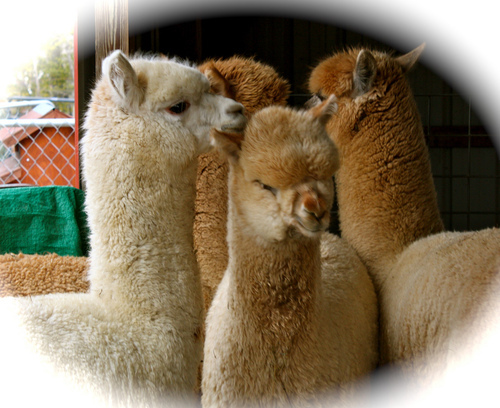 All of our alpacas, including the whites and lights, have dark color genetics. We own or co-own over 10 champion herdsires, of all colors. Through investing in breedings to awesome herdsires and partnering with successful breeders, we have improved the quality of our crias every year. 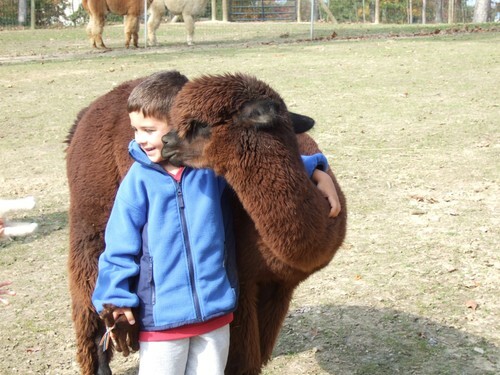 We are pleased to see a resurgence of interest in alpacas and lots of "new people" coming into alpaca farming, just as we did 14 years ago, with no agricultural experience! We are anxious to help and mentor newcomers. Besides alpacas, we also have a wide variety of pastured chickens and are breeding Bielefelders, an auto-sexing, dual purpose breed who lays large brown eggs. Wildwood is also home to two English Shepherds, a rare, landrace breed.